Chileans love carbonated soft drinks. You can find a Coca-Cola just about anywhere in the country. But what if you want a diet drink? Don’t expect to use the literal translation of diet–or dieta–attached to the drink name. 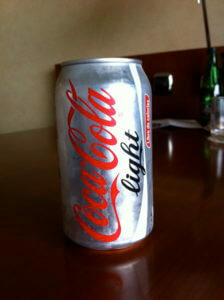 Diet drinks in Chile have the English word “Light” on them. So if you want a Diet Coke, ask for a “Coca-Cola Light”. Of course, you’ll also find several brands that use the “Zero” label for zero calorie drinks, like Coca-Cola Zero. If soda isn’t for you, remember that the drinking water in Chile is safe to drink. However, you can always get agua mineral which is typically bottled water with carbonation. If you like your water without the bubbles, be sure to ask for agua sin gas (or without gas). Hey 🙂 I love your blogs! Thank you!